The 3 bedroom apartment is very large and is in a U shaped layout. Built in 1820 (and traversing Rue Obscure, dating from the 13th century) the entrance has bedroom 1 to the left (2 single beds), then a fully fitted Kitchen with a basement off, housing the air-conditioning, ironing, washer and dryer. Beyond the lower hall is the main room. Bedroom 2 and 3 each have huge sleigh beds with ensuite bathrooms. The master bedroom has 2 windows overlooking the port. Everything in the apartment is new, with a very high standard of furniture, bedding, curtains, fabrics, flooring etc. 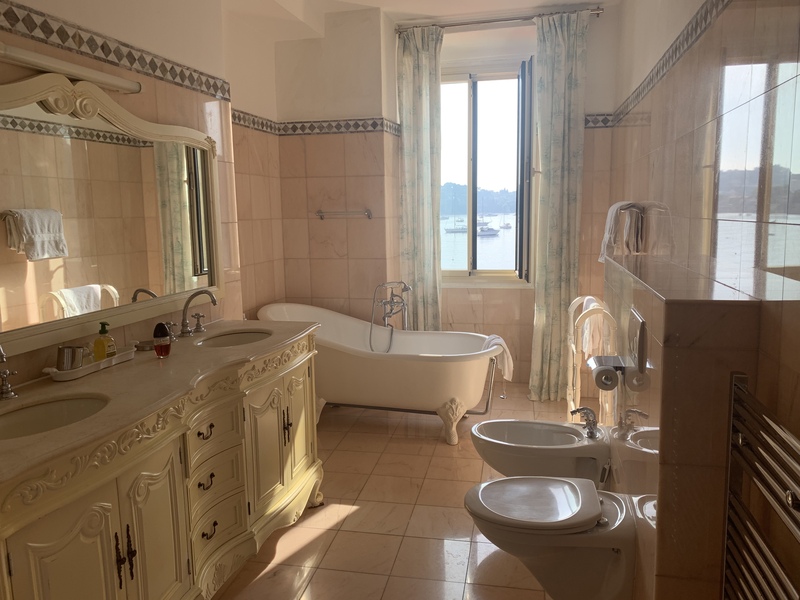 The 3 bathrooms are clad in Pink Portuguese Marble and the main bathroom has a high back bath at the window overlooking the port. All bathrooms have walk-in showers. Floors are Oak and the furniture is French Provencal style. The kitchen is cream Provencal with a tiled floor. The total area is c. 2400 sq. feet making this the largest apartment in the Old Town. The location is unbeatable as it has 5 windows to the front (+ 6 at the back) and there are no stairs to climb. There are 2 balconies to the front. One is fitted with table and chairs. All ceilings are high as it was constructed from 3 old apartments made into one! The main building dates from 1720 and Rue Obscure (underneath) from 13th century. The basement has a separate entrance for bicycles etc if required. Although the apartment is on the second floor from the port side, the entrance is on ground level from Rue Poilieu, meaning that there are no steps and that this apartment is suitable for everyone. A car is not necessary in Villefranche. However there is a public car park 120 yards away (€ 8 / day) and a free car park on the old Citadel (300 yds away).